An evaluation team from the Accreditation Council for Business Schools and Programs (ACBSP), USA, under the supervision of Dr. Douglas Gilbert, Dr. Dolgormaa Jamiyan and Prof. Umesh Chandrasekhar visited the School of Business and Economics (SBE), NSU on October 5, 2015. Mr. M. A. Kashem, Chairman, Board of Trustees, Dr. Gour Gobinda Goswami, Vice Chancellor (in-charge) and Dr. Mahboob Rahman, Dean, School of Business and Economics, NSU welcomed members of the evaluation team at the NSU Campus. 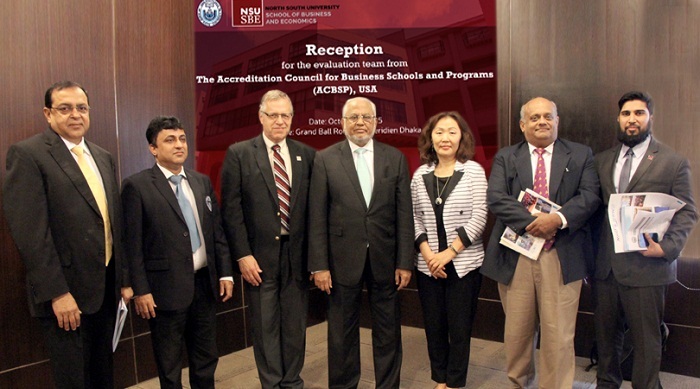 NSU SBE is the first Bangladeshi business school that received candidacy for American accreditation and is now at the final stages of obtaining accreditation. In the evening, NSU hosted an exclusive gala dinner for an aristocratic assembly from industrial, editor, academic, bureaucratic sector of the country at Le Méridian, in the city.